The minister might have an easier time of the matter in one way. With a pair of waders and a robe, he can get back into the action fairly quickly. Still, the minister needs to remember what to say and how to stand and what to do if a third grader does a cannonball into the water. Unless he has some clever lay person do the job, the minister needs to deal with keeping the floor from being too slippery (can’t have the church being sued) and making sure people have towels and such (can’t have new believers catching pneumonia). Yessir, baptism can be a mighty inconvenience. It might involve inviting family that we really don’t like very much and probably some kind of special meal after church. You’ll almost certainly have to show up early or duck out of Sunday School early. Still, it’s a one-time event in most cases, so surely we can put up with all these annoyances. Do I exaggerate? Perhaps, although I’m not at all sure. What I do know is that the trivial Sunday-morning annoyances that might accompany a baptism in 21st-century America do not compare to what Jesus dealt with. 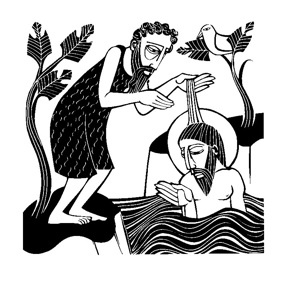 Let’s forget for a moment that Jesus had no actual need of baptism. Was he showing identity with himself? Instead, I would focus on the first half of that verse, where Jesus travels from Nazareth to a place on the Jordan, probably down near the top of the Dead Sea if tradition has it right, just to allow John to perform a symbolic ritual that really didn’t apply to him. This would be somewhat akin to traveling the breadth of the United States in an un-air-conditioned car to join a club to which you already belong. Apparently, Jesus found baptism to be very important, not because it actually did anything to make him holy but because it fulfilled all righteousness (Matthew 3:15). If Jesus could yield to that sort of inconvenience, how much more should we, who actually need to repent and experience the forgiveness of sins, the experiences that baptism symbolizes, do so? Baptized or not, let us never look on this one of two sacraments Christ left his church as inconvenient.